Labyrinth isn’t the only cult classic from yesteryear that’s poised to receive a new lease of life – according to The Hollywood Reporter, that long-rumored Coming to America sequel has officially sprung into life, and who better to script the screenplay than the original writers? That’s right, after introducing Eddie Murphy’s wonderfully pompous Prince Akeem to the world in ’88, Paramount has welcomed back Barry Blaustein and David Sheffield to pen a treatment for the follow-up. THR goes on to note that the sequel is currently lingering in the very early stages of development, though we understand Kevin Misher (Carrie, Public Enemies) has signed on to produce. The big question now is, of course, whether Murphy will reprise as Prince Akeem, who uprooted from a wealthy African nation for Brooklyn, New York in order to escape the clutches of an arranged marriage. It was the ultimate pitch for a fish-out-of-water comedy, and the John Landis-directed Coming to America arguably still holds up thanks to performances from Arsenio Hall, Shari Headley and the great James Earl Jones. Indeed, the latter recently stepped back into the voice booth to record dialogue for last year’s Rogue One: A Star Wars Story, and has even inked a deal to appear in Jon Favreau’s live-action depiction of The Lion King. Look for that one to bow in late 2018/early 2019. 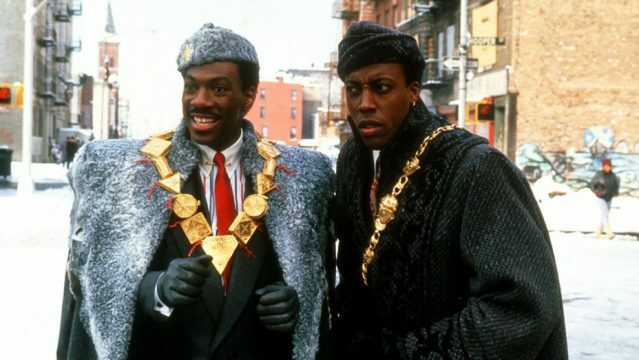 Barry Blaustein and David Sheffield are officially on board to hash out a screenplay for the Coming to America sequel, but will it be enough to pique Eddie Murphy’s interest? Going one step further, will it be enough to pique our own? Time will tell.